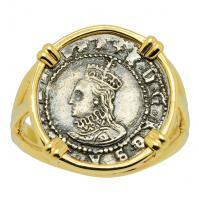 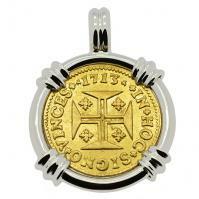 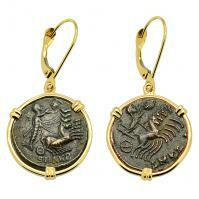 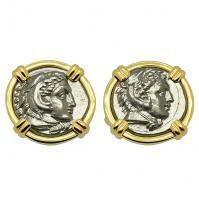 Dive right in and explore our vast selection of handcrafted Authentic Treasure Coin Jewelry. 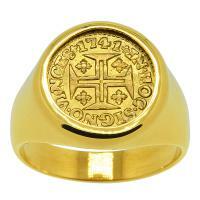 Every item we offer is one of a kind and guaranteed genuine. 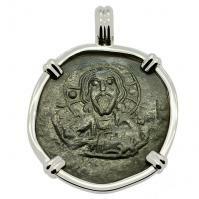 From Ancient Greece, the Roman Empire and Medieval Times, to a great collection of historic Shipwreck Coins recovered from the depths of the sea. 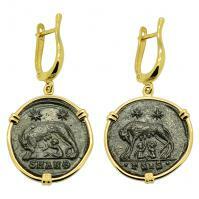 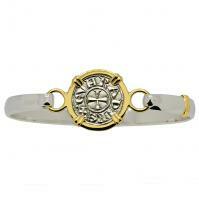 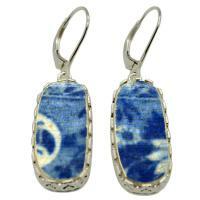 A Great Selection of New Treasure Items with FREE Priority Mail Shipping! 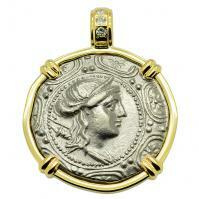 Greek 167-149 BC, Artemis "Goddess of Women" tetradrachm in 14k gold pendant with diamonds. 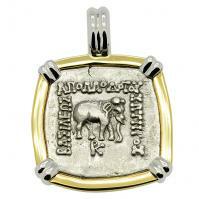 Indo-Greek 180–160 BC, King Apollodotos I drachm in 14k white & yellow gold pendant. 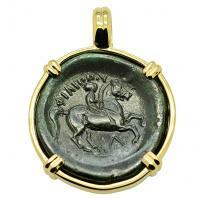 Greek 359-336 BC, King Philip II Horseman & Apollo bronze coin in 14k gold pendant. 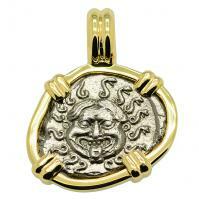 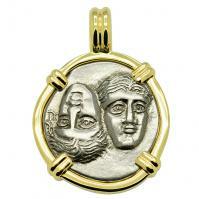 Greek 400-350 BC, Gemini Twins of Istros drachm in 14k gold pendant. 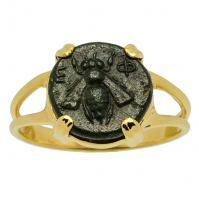 Greek Ephesus 375 - 325 BC, Bee and Artemis bronze coin in 14k gold ladies ring. 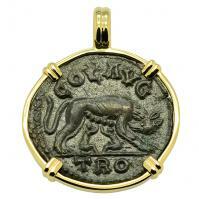 Roman Empire AD 250-268, She-Wolf Suckling Twins & Tyche coin in 14k gold pendant. 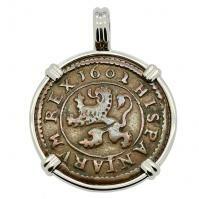 Spanish 4 maravedis dated 1602, in 14k white gold pendant. 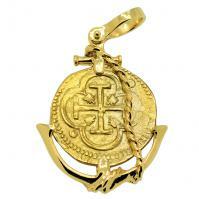 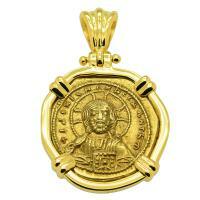 Spanish 2 escudos "Doubloon" 1556-1592, in 14k gold anchor pendant. 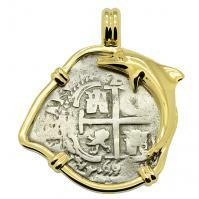 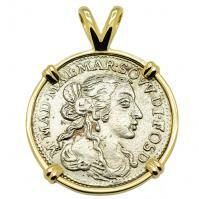 Colonial Spanish Peru, King Charles II two reales dated 1668, in 14k gold dolphin pendant. 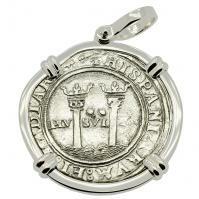 Spanish 2 reales 1542-1548 in 14k white gold pendant, 1550 shipwreck Northern Caribbean Sea. 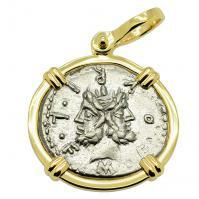 Hammered coinage describes the most common form of coins produced since the invention of coins in the first millennium BC until the 15th-17th centuries. 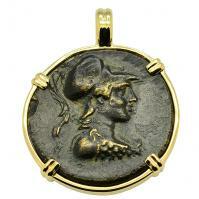 Of all the things that have survived the passage of time between ancient Greece and today, the Greek myths are probably the most enduring. 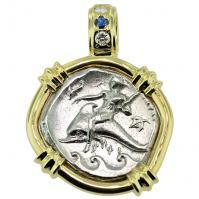 The Romans adopted gods and goddesses that were very similar with the same attributions as the Greek gods and goddesses however they had different names. 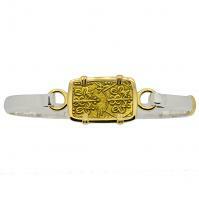 From the 16th to 18th centuries, "Cob" coins, also known as Macuquinas, were minted and used heavily in the territories of the New World.